There's so much more to do in Cairns then lazing on the beach whether you want to experience some extreme adventures by air, over sea or through rainforest. Taking off in a small plane, jumping out in a tandem sky dive and floating back down to earth with views of the Great Barrier Reef and brilliant green of the rainforest is a once in a life time experience. If you're even more game you can take on the all-you-can-bungy experience which has you diving out from the bungy tower and giving you once again beautiful views. The Minjin Jungle Swing is for those of you who are a little less interested in taking a complete leap of faith and will have you flying through rainforest canopies. If this is all still sounding a little too heart stopping then a helicopter ride over the area will calm you down a little. 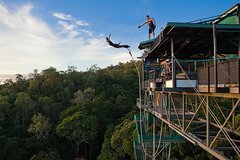 Leap into an adrenaline-fueled adventure with a bungy jump or Giant Jungle Swing at the Cairns Bungy Tower, located in lush rainforest with views of the Coral Sea and the Great Barrier Reef. Whether you are a first-time jumper or an experienced thrill-seeker, you'll experience the exhilaration of soaring through the air when bungy jumping or taking the Giant Jungle Swing, and the professional staff will make sure you have fun and stay safe. Back on the ground, enjoy relaxing around the sundeck, bar and gardens as you watch the antics of your fellow jumpers! Looking for some adventure in paradise? Get high in the sky on a tandem skydive over Cairns with spectacular bird's-eye views of the Great Barrier Reef and World Heritage-listed Rainforest. 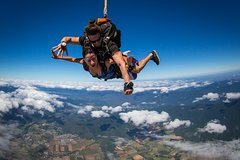 Experience the adrenalin rush while freefalling from up to 15,000ft. No experience necessary! Bring out your inner dare devil canyoning in the Cairns rainforest where you abseil, zip line, slide and jump beside waterfalls and into pools. 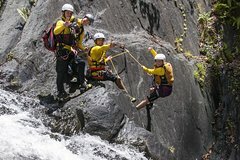 Crystal Canyon is located in a secluded section of Crystal Cascades where the excitement of canyoning a rocky watercourse can be enjoyed in a safe and controlled environment under the supervision of experienced guides.